Today I want to share some of my experience with you. I’ll tell you why I don’t like to block my finished pieces and give you an alternative that I find more natural and gentle for the fibers of my projects. First things first: what is blocking? 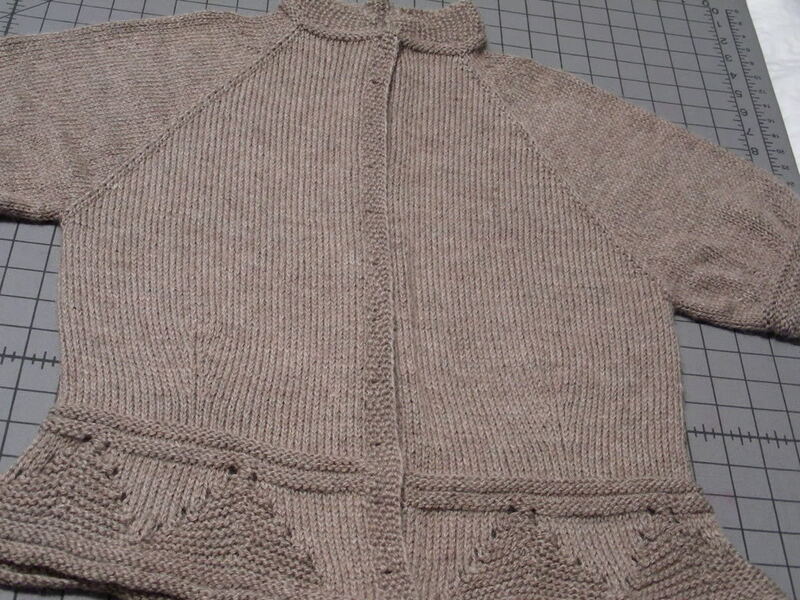 Blocking is a method of stretching and shaping a finished knitted piece to reach the dimensions suggested in the pattern. It’s also used to make two pieces that need to match the same size or to make your stitches look nicer and more even. Wait a minute! That actually doesn’t sound too bad! Knitted projects often won’t come out perfect as soon as you bind off so shouldn’t you use blocking to tell the stitches where to sit? First of all, blocking won’t make up for those stitches you forgot to decrease or that little section where you went off pattern. It’s hard to hide knitting mistakes. Blocking can mistreat your piece, fibers will suffer from being forced to do something they don’t want to do naturally. I like my pieces fluffy; naturally taking their shape and staying true to my work. Blocking cannot make up for sizing issues. If the sleeves on a knitted garment are too short you need to add some extra rows. In the end, blocking a piece into shape will only last until you wash the piece. As I mentioned before textile fibers have a life of their own and they don’t like to be forced into a shape they’re not designed to go. Having said that there are situations when blocking makes sense: For example the art of lace knitting. Here you should use blocking to show the lace knitting by stretching the piece out and pin it to a grid to open it up. You will not mistreat the piece in that case because you worked all the openings into the shawl. Blocking Lace is an option since it won’t hurt the fibers. As you might know by now I love to do things my way and I have so much fun thinking out of the box. 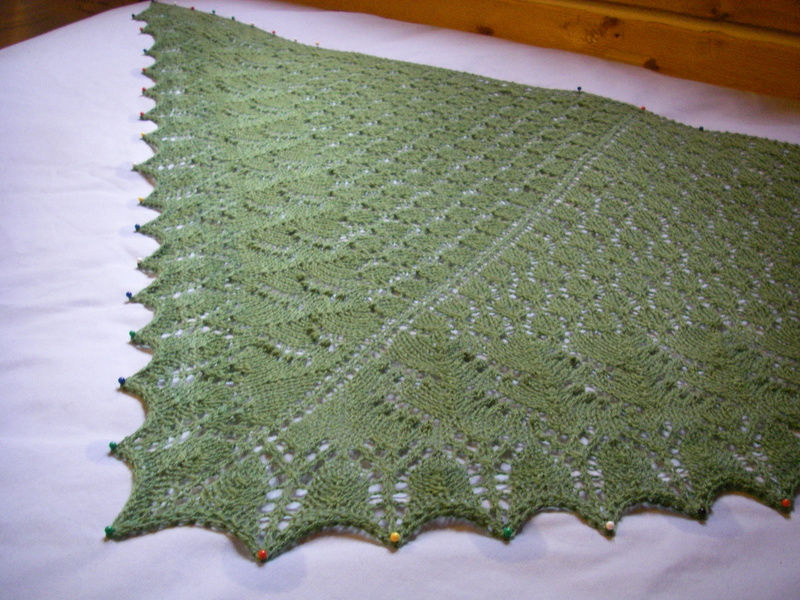 When I created SKEINO’s Miss Grace Free Form Shawl I could have blocked the piece but I didn’t. Here is how I treated my finished piece. If you purchased the kit this might be an inspiration for you once you’re finished with your knitting. Firstly I gently machine-washed the shawl using a mild detergent. The yarn is superwash so machine-washing is a wonderful feature about this shawl. After that, I spun the piece at high speed and dried it in a machine dryer at low temperature for 3 min. Then I put the shawl outside on a warm tile surface into the sun (Here’s where the Florida climate comes in handy!). 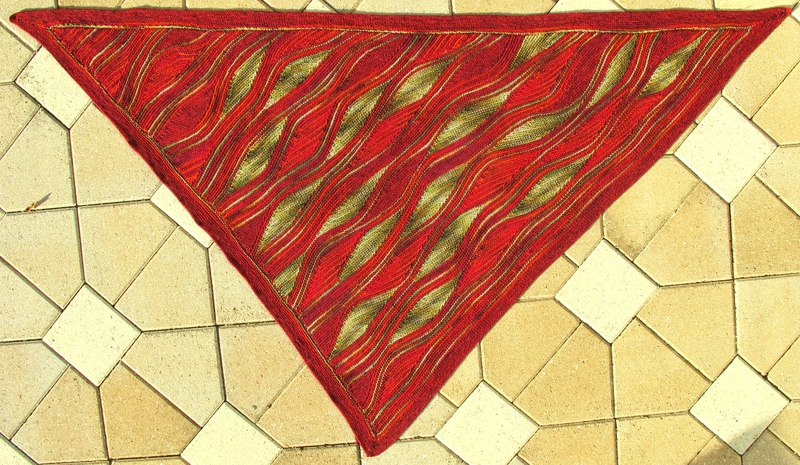 Not forcing it, I perfectly shaped the triangle the way the shawl allowed me to do it. Resting on top of the warm tiles I let the Miss Grace Shawl dry in the sun. The piece came out great. It was perfectly shaped with wonderful memory, great drape and wrinkle-free both now and into the future. This is the original Miss Grace Shawl model resting on hot tiles and drying in the sun. A scarf, shawl, cowl or even a poncho and a cape should be cuddly and drape well. Wash your piece gentle by hand or in a machine (if it’s a superwash yarn). Don’t be afraid to spin it, the drum only runs in one direction and will not felt your piece. It’s the agitation (back and forth) that causes a piece to felt. The dryer is a very good tool to make your piece fluffy but watch the temperature and the timing – it’s crucial! Stay close to the dryer and test the progress every few minutes to be sure that you don’t ruin the piece. It should always come out damp for the final air dry. If you have a warm, sunny surface let your piece dry in a shape it allows you to. What are your experiences with blocking? Are there any arguments pro or contra blocking that I didn’t mention? Let me know in the Comments section!